The plan was hatched last-minute, I’d admit, more of a moment of serendipity than anything else. My friends Baron von Lahey, Professor Marvel, and General Caled were all told of this the day before to make an announcement at the end of the Fashion Show at TempleCon. In side pouch, the dragon-crested one I usually carried as part of my con gear, I had packed the ring, a gift I had spent months looking for. We were both modeling for Festooned Butterfly. A lot of my friends in the community were in the audience too. After the groups swept the stage, my friends called up Lucretia and me to the stage one last time for a special announcement. Lucretia had no idea what was going on, and the Baron had to turn her around to face me. I told her that Vietnamese New Year had just happened, the year of the Cat and was the time for new beginnings. We’ve already celebrated with my family, but I said, with a smile, how Lucretia had been asking for a year when she’d get her own ring. And then I went down on one knee of my own and asked if she would marry me. I expected her to cry. I didn’t expect to be crying too. We’ve been engaged before. Privately, when she proposed to me in a scheme that involved the Baron, student filmmakers, the local TV station, and several close actor friends. Officially, in the eyes of my family, when we had gone through a traditional Vietnamese engagement ceremony last summer. 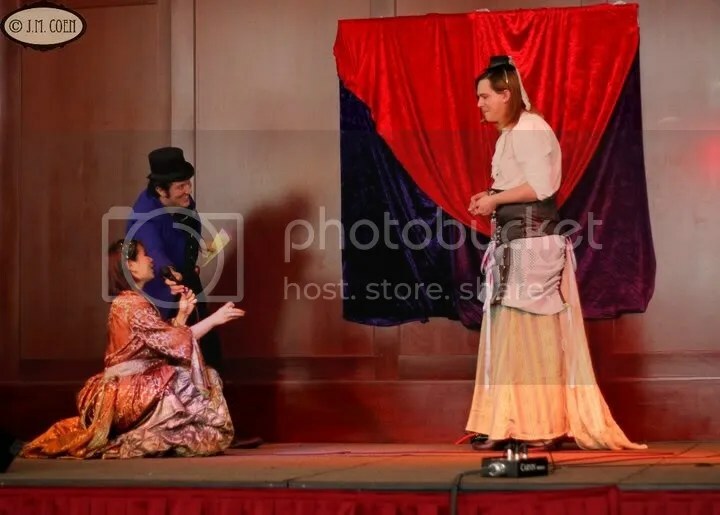 Both times, however, I played the role of the woman. It’s been complicated, especially in a relationship with a transgender partner, and Lucretia has had to take on the “male” role too many times to count. My extended family and my parents don’t know the status of our queer relationship, and Lucretia’s family hasn’t been accepting of her identity, even when she came out to them years ago. Balancing my cultural identity and the nature of my queer relationship has been difficult too. Do I cast away my Vietnamese tradition because for the sake of the person who I love? Am I ready to deal with family rejection, especially after years of growing up facing racial rejection from non-family members for not “being white”? Where can I find solidarity in a whitewashed queer community? Where do I even stand, when I never identified as being queer myself? I’m a straight woman in a queer relationship, and I’ve never been attracted to any women before Lucretia came out to me as being trans early in our relationship. Not to mention Lucretia’s own struggle with family acceptance from her conservative relatives and social acceptance in a world mostly ignorant of trans issues. Part of the reason why our relationship has endured for so long, I think, was the open communication we’ve shared with each other through the years and learning from our respective past experiences. We grew together and grew from our honesty with each other. I’ve never shied away from saying that it was my fiancée who had first introduced me to steampunk. 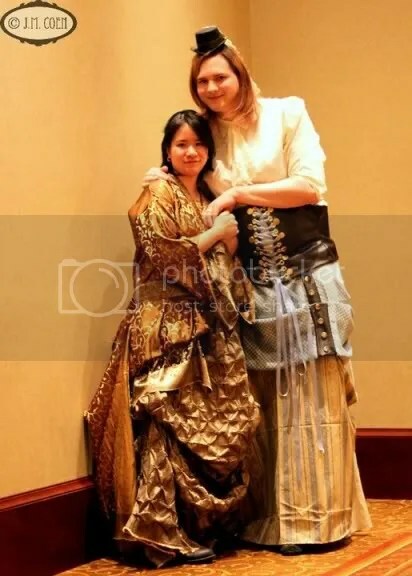 In an odd way, participating in the steampunk community has become another aspect of our relationship we had in common (though we both engage in the steampunk community in different ways). Outside of steampunk, being a couple in the “real world” has been frustrating, enraging, and at times, frightening. We’ve been refused housing because male gay couples didn’t welcome a bio woman into their household. Lucretia has been attacked in the streets when walking by herself. And when we’re together, there’s always that invisibility where people don’t recognize that we’re together, even if we are holding hands and sitting besides each other like any other couple. 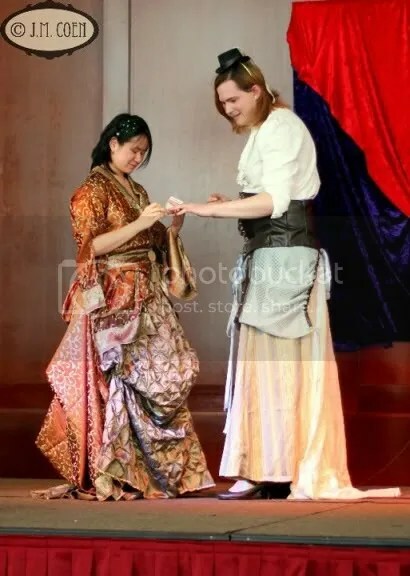 We’ve been approached by missionaries seeking to confront Lucretia about her “sinful” lifestyle, but get confused when I tell them that she is my partner, so biologically, we’re heterosexual, right? When we’re out, people had catcalled us in the streets or yelled slurs at Lucretia, while ignoring me. I’ve felt weak and stupid because I was physically unable to defend the person I love in a lot of these situations. The best solution we’ve learned is to walk away from these situations, and not to go into areas where we’d be targets. In New York City, however, that’s been a big problem, especially in the socially conservative Harlem neighborhood where we lived together at the time. Racial tensions and class differences complicated how we were viewed; in a working class neighborhood, we were seen as the gentrifying villains, especially with the stereotype that all queer people and Asians-Americans are wealthy, although we suffered the same financial hardships that everyone else around us did. Over time, I was lucky enough to gain a modest but steady income, but it wasn’t enough to support two people. Lucretia wasn’t able to find a work where she wasn’t taunted and disrespected by customers on a weekly basis or overworked and underpaid. The white elephant in the room, of course, was her safety, though it wasn’t something I wanted to bring up. The specter of violence seemed to haunt the back of my thoughts: what if one night, she didn’t come back to the apartment after closing? What if she got accosted in the street because she had to leave home at 4 AM in order to open at Starbucks? We were both women and seen as vulnerable in our own separate ways; when alone, we’ve had to avoid unwanted advances, catcalling, and people following us on walks home. But in my head, I feared something much worse for my partner, because she stood out much more as a hated target. And no matter where we traveled in the city—whether it was Harlem or Fifth Ave or Times Square—our vulnerability hadn’t changed. People say New York is the city where you can do anything and be anything; in reality, you can do anything or be anything as long as you’re in the right neighborhood. And we weren’t finding that right neighborhood no matter where we went. Finally, after months of hardship, both emotionally and financially, we decided that the best solution was for Lucretia to move back to Massachusetts. We hoped that someday we’d be able to live together once we gained her financial footing back. For the past two years, we’ve been living separately and maintaining a long distance relationship. Neither of us have a large income for travel, but really, the thing that has helped us so much was the steampunk community. Going to conventions started to coincide with having a chance to be together in a space with our friends and without the abuse that everyday life usually inflicted on us. That is why proposing to Lucretia was both a public acknowledgment of support and a personally emotional gift to her. Lucretia is my woman, and deserves to have her engagement ring just as much as I have mine from her. And the steampunk community—our friends, and our allies—have been there for us in ways that even our own families have lacked. It’d be exaggerating to say that only steampunk has made our relationship possible (and a discredit to the endurance of our relationship and the many non-steampunk friends and supportive spaces we have elsewhere). What I will say, however, is that without finding the steampunk queer folks and allies we have met and befriended, we wouldn’t have stayed involved. That is why I wanted to share with this important step. The importance of Lucretia being my woman, my love, my partner for the rest of our lives. And I thank you all—everyone who reads and understands this and has supported us through this journey. Congratulations! May you both find safety and continued happiness. Once again, congratulations to both of you ladies! Congratulations to you both! This was a delight to read and I am so happy for both of you. Do we get to see a picture of the ring? *hugs* and many congratulations (again!) to you both! Congratulations and wishes for much happiness from Dan’s Dad. Great Story, beautifully written and well put. Thank you. It may be a bit belated but many congratulations and Best Wishes to the both of you!